The lack of instrument cluster in the Tesla Model 3 might be its most controversial feature. It helped create rumors of a head-up display (HUD) fueled by Elon Musk’s comment that the steering controls will feel “like a spaceship”. But one thing that it created for sure is an interesting problem for the user interface of the center screen, which now has to display information generally shown on the instrument cluster. We started getting a pretty good idea of the UI with the first few pictures of the Model 3 release candidates, but new pictures are furthering our understanding of the feature. When Musk killed the idea of a HUD in March, he also said that Tesla Model 3’s user interface is designed with self-driving in mind. It made it sound like the UI will be subpar for actual drivers until full self-driving is available, but Musk insisted that drivers “will not care”. How? A few things to keep in mind here are that the vehicle was clearly in developer mode and therefore, the right side of the screen is not something that end users are likely going to see. Also, the vehicle was parked when the pictures were taken and therefore, the left side of the screen likely represents the UI when parked. 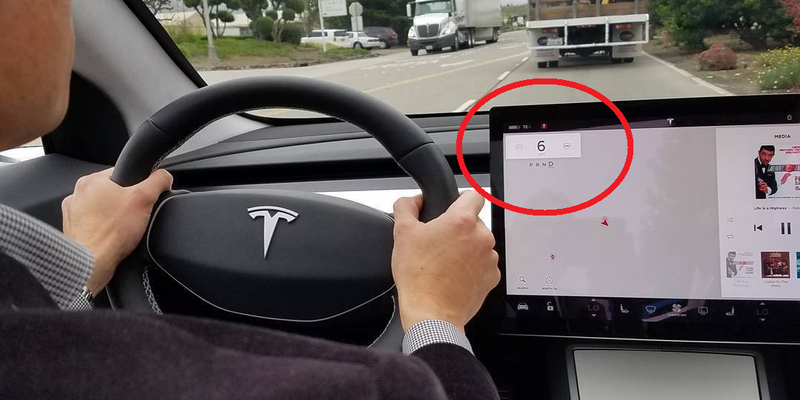 It’s likely going to be different when the car is in motion and we see the “navigate” button on that side of the screen, which seems to indicate the map would appear in that section. On center screen. Also, center screen *will* show speed as an overlay that changes opacity according to relevance. Hopefully, it will be customizable and drivers will be able to adjust the UI to the preferences. As usual, what we see on the release candidates don’t always translate to the production version since they are being tested at different stages of readiness. But that’s our best look so far and we might have to wait until July for anything better. Let us know what you think of the Model 3 UI so far in the comment section below.